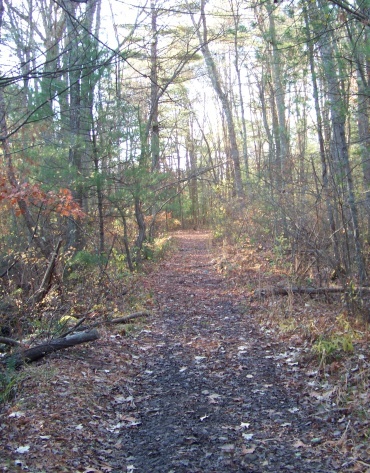 Hiking trails in the town of Whitman, one may think there is little to offer in this tiny community! There are a few though, mostly with a need to develop, and those that hold promise! Major routes through this town are Route 18 (Bedford St) running north to south, Rt.58 (Plymouth St) also running north to southeast. Routes 14 and 27 run east west with 14 taking a gentle southerly dip while 27 takes a sharp southern turn on the eastern side of the center of town. Whitman is one of many south shore towns that can become quite busy with rush hour traffic. Most is contained to Route 18 though. with a strong sense of community. This park features a playground, ball fields, a basketball court and town swimming pool. It's also a favorite sledding place in the winter! The area now known as Whitman was first settled in 1670. 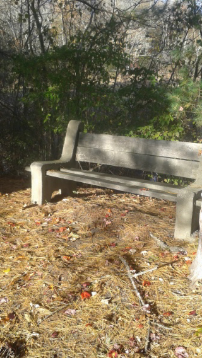 It was first known as the Little Comfort section of Bridgewater. In 1712 the town of Abington was incorporated and the area now known as Whitman became the southern parish of that town. In 1875 this southern parish became established enough to separate as a town on it's own. Initially taking the name of South Abington of which it had already been known as. In 1886 it adopted it's current name of Whitman taken from Augustus Whitman a prominent citizen whose family lived in South Abington. 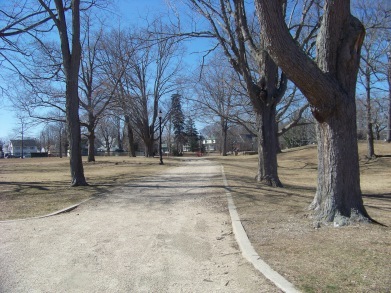 It was Augustus Whitman who donated the land for the current Whitman Park. In the early years South Abington was an agricultural community. Most settlers on the south shore started as homesteaders producing what they needed for themselves. The soil of New England though is not optimal for farming and soon the timber industry became prominent. It is said that the USS Constitution used timber from Whitman in it's construction. During that time of the Southern parish of Abington, many cottage industries were started. As the town grew and established itself so did those small cottage industries. By the 1800's several had grown and turned into large factories helping to make Whitman an important manufacturing community. Another prominent citizen, ran a foundry called Colonel Hobart's Bell and Cannon Foundry and the name of Hobart was also attached to the Dunbar, Hobart, and Whidden Tack factory. The civil war helped Whitman produce it's leading manufactured product,shoes and boots. Like it's parent town of Abington, Whitman became a lead manufacturer of this product and at one time the town had as many as 20 shoe factories, with other accompanying products manufactured such as the steel shanks for those shoes. This continued till the mid 1900's. Route 18 is a main travel road through town. 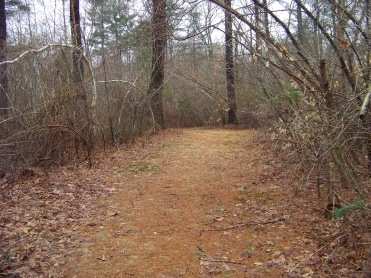 Before the town was settled this major route was the indian path named Satucket Trail. In those days Indian trails were made into cart roads for early settlers to travel and for trading their wares or livestock. Once Boston became the capital, these cart roads became important for officials to use as a means for travelling on official government business. The journey was usually long and difficult as roads were dirt and not well maintained. The need for good communication between cities became nessecary and the Post and Turnpike or Toll Roads came into existence. Route 18 was one of these Turnpike Roads with a toll house. The house was said to have been built in 1709 and was an inn as well. It was a good destination to rest horses and get food. Later it became the toll house restaurant where Ruth Graves Wakefield mistakenly invented the toll house chocolate chip cookie. Interestingly the house the Wakefield's bought was referred to as the Old Smith House. This is the house where Frank Vining Smith lived a famous maritime painter who was not able to join the Navy, took that love of ships to canvas. His paintings included clipper ships, schooners and whalers. One look around the internet and you'll see some of his paintings are quite valuable. Another interesting find is, that through his mothers family line he was attached to the Whitman name. Further down that line the Hobart name is attached as well. Unfortunately the house/restaurant burned in 1984. If my information is correct it held much history!! 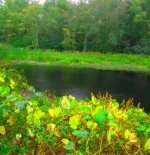 Though Whitman does not seem to have much in place for developed hiking trails yet, there are some interesting areas to walk or explore. The start of exploring Whitman should be at Whitman Park. entrance dubbed the Whitman Hanson Trail. A hidden gem tucked close to the intersection of Auburn and Washington Sts is the Donald Flaherty Trail. A quick stretch of pleasant walking alongside a scenic wetland area. This is an area that could use a bit more development. 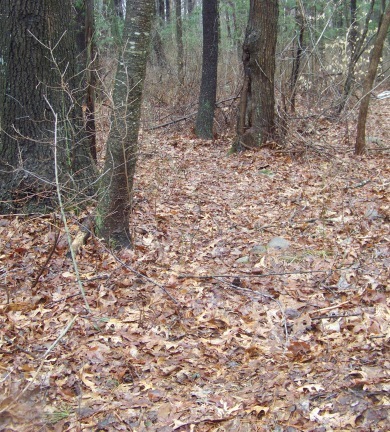 There is a faint hiking trail that runs the length of the property. Another area that could be developed a bit for passive recreation. One trail exists that needs work.